This is a pair of horseshoecrabs my husband found at the local fish seller on the way to my mother in law's house. It's in remote area, near to the sea. The people who live along the road, the villagers catch and sell the fish, crab and shell. It was very difficult to accept for me in the beginning, shocked, that a rare species such as this horseshoecrab, a living fossil, is being caught and eaten by local people. My husband was particularly concered that this endangered specie was a smaller mangrove dweller that even rare. He gave a pitty and bought them to release them. As I spent more than 10 years in this Borneo island, getting to understand that being angry and blaming the local villagers of consuming endangered species is not what they should deserve. Those villagers have low education levels. High school graduates are well praised, many school dropouts, and primary school graduates for older generations, some illiterate. If one grew up primary school graduate and depending the earnings on catching anything available near one's home, it will be very hard to persuade not to sell and eat the protected species. I feel it is showing the failure of education system, lack of support for lower income levels in this region. Well, anyhow, when I released them I didn't noticed but while I was doing the dots, I realized of their scratched shells and brocken claws. Then I understood that this pair, even caught together, looked battered and worn, are old pair that survived that long, made my heart warm. Woow, how did you get your words upside-down!? Yah agree @trincowski! For customer too! Imagine 1million dots that I do will go into your skin as needle! Thank you as always @c-squared!! Theres a horseshoecrab museum in Japan. If I ever pay a visit, will definitely write a post! Dear Artist @naomipangolin ! This is stunning painting and I have resteemed and upvoted it from my FineArtNow Project ! 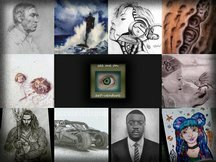 The Idea of this blog is to bring creative people and art enthusiasts together and to increase the reach of Steemit - Artists ! See you soon ! I hope more people are being made more aware of these beautiful creatures ! Thank you for your appreciation @veryspider ❤️ yes indeed, you ever seen the belly side? Their legs are like.... totally alien from sci-fi movies, just extraordinary!!! What a beautiful drawing and a very thoughtful post. I would like it if both the native islanders and the animals can coexist together.